Miyamoto Musashi was renowned in his own time as an invincible warrior, a master artisan, an author, and philosopher. Today, his philosophy is still revered by the Japanese and used as a guide for daily decision-making-and business strategy. He wrote A Book of Five Rings not only as a thesis on doing battle, but also as a way to approach and live all aspects of life-'any situation where plans and tactics are used.' When A Book of Five Rings first appeared on North American bookshelves in 1974, its message took the business community by storm. It provided insight into the then-emerging Japanese influence and offered a new way to think about business. It instantly became a vital tool for assured success and has remained so ever since.The principles in this work are as true today as they were over 300 years ago, and are as valid for business negotiations as for hand-to-hand combat. 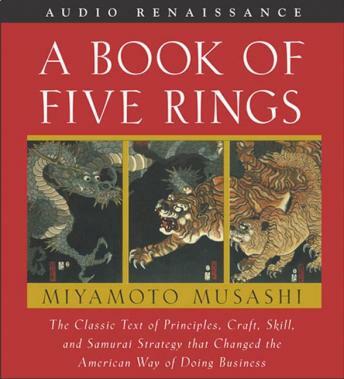 Based in the principles of Zen and advocating a hands-on approach to mastering the skills for winning, A Book of Five Rings is very likely the most perceptive guide to strategy ever written. This book is a classic military studies book, over 500 years old, written by a master swordsman in the early 1600s Japan. His treatise, Book of Five Rings, has become a must read with those who study the art of war, and often can be found on the shelves next to The Art of War, by Sun Tsu. If the reader is expecting a modern treatise, filled with verbose language and hyperbole, the reader will be sorely disappointed. This book is a philosophical treatise on combat. It will not walk you through every facet of thrust and parry, but provides the reader with thought provoking contemplation on the art of personal combat. The Japanese used both books in their business ventures, as they consider all business to be a form of warfare. Enjoy the read, close your eyes and see the words come to life in your mind. A great classical read. Although somewhat platitudinous, there are a few nuggets sprinkled throughout. I enjoyed it, though unfortunately the book is not terribly memorable. I tend to think the Western mind doesn't appreciate the kinds of ideas expressed in this book as much as we should, however. I did not find this book of much value whatsoever. It appears to be a hastily written book, taking ancient Zen writings and trying to make them sound trendy. I don't see much translational value or practical application of much of anything within this book.